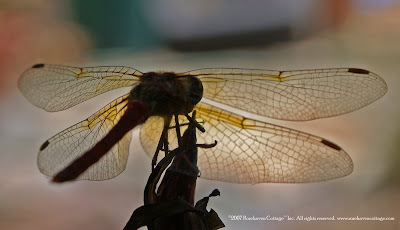 After reading the blog over at It's All Good and then following his link to Stolen Moments and seeing the beautiful photographs there (including the ones of dragonflies, hummingbirds, and kitties), I realized that I haven't ever posted my own dragonfly photos. 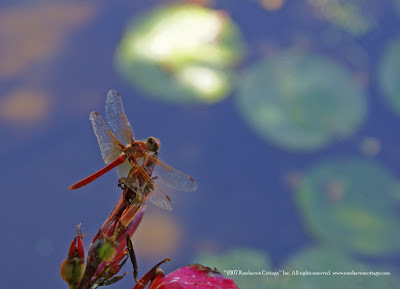 So on this gorgeous Saturday, I'm posting my favorite dragonfly photos that I've shot here at Rosehaven Cottage out by our pond. "Dragonfly Silhouette" (at left) was chosen to grace the homepage as part of the photo rotation of PhotoShelter (which made me very happy!). This little guy was trying to beat the heat on a 100 degree day. He was just "chilling" on a canna lily bud. Everytime I got a little too close, he'd fly away, circle the pond a few times, and then land right back in the same spot. It made it much easier than most photography sessions of wildlife and insects. I was able to get some beautiful shots because he was so compliant and loved that canna lily bud so much. "Monet Dragonfly" (below) was taken during the same photo session. I didn't have to do any post-production tweaking to get the amazing "Monet" effect that I was surprised to find once I got back to the computer. Those are our own lily pads in the background that create this lovely effect. And the color was just this way when I got back inside. I only had to lighten the photo a little bit and do some post-production cropping. Sometimes digital photography is full of great surprises. Prints of both photos are now available at the Rosehaven Cottage online gallery. Monet Dragonfly is also available as a tile coaster or a hardwood keepsake box. I posted a poem on my wprdpress site. address link herein. "The Wings Of The Dragonfly" I penned it the summer I turned nineteen. Think you'll like it. 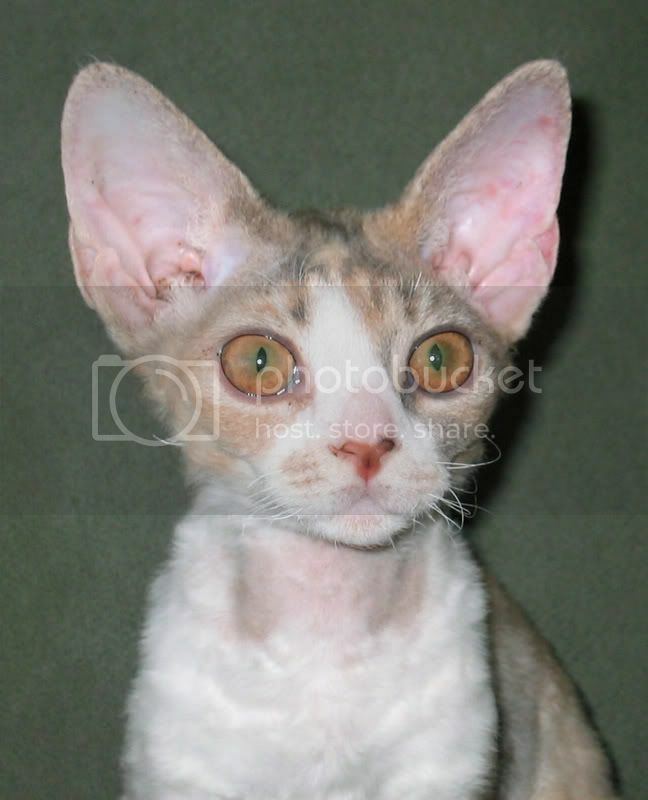 These photos are quite good. Oh thank you so much for sharing your poetry with me! I loved it so much! I find myself listening for the wings of the dragonflies on summer evenings. They dart about in a canopy over our gardens catching prey on the wing. They are my friends because I haven’t had mosquitos this year because of them. Your poem brought that all back. Thank you! My, you are quick! I just went over there to add rosehavencottage to my blogroll and you had come and gone. I should call you Dragonfly ...you're as fast as they. The colors in the Monet Dragonfly are beautiful! I remember being afraid of dragonflies when I was little. I hope I can teach my grandson about their beauty and usefulness. I thinknow people are a little more aware of nature than they used to be. Beautiful photos. I love the Monet effect in the second one - very cool. Dragonflies are so cool - most of the ones I see are dark blue or dark green - and those lovely wings - very pretty. Oh wow -- absolutely gorgeous. Thanks for sharing these. I want to write something cool and controlled and appreciative about those dragonfly photographs, but my fingers channel my heart and it keeps coming out "WOW! I *love* those pictures! Those are *fantastic*!" two perfect photos of natures PERFECTION! The warmth of the colors and the backlighting of the silhouette make it look like a hot summer's day ~ love this! Interesting that picture #2 has cool colors, soft focus, even the dappled sunlight of a painting by Monet! Stunning!